PVC duct hose is an economical and flexible hose product line for light duty transfer of air flow, or nonabrasive materials. 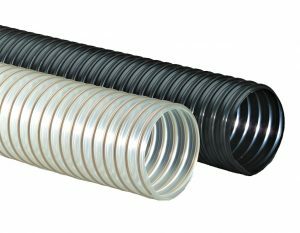 PVC duct hose contains an embedded spring-wire helix or an external poly helix. Available in standard (0.025” to 0.028” wall thickness), light (0.020” thick) or heavy grade (0.035” thick) versions. A ‘Stretch’ version is available for higher compress-ability (6:1 ratio) in select popular sizes. Available with UL 94V-0 flame retardant approval. Available in blue opaque or black opaque material and translucent clear. Clear PVC material meets FDA requirements. Alternately, PVC suction hoses are offered with a thinner wall for duct and blower applications. These hoses have a rigid plastic helix and thin flexible PVC wall, often clear. They also can include a copper ground wire.